1. 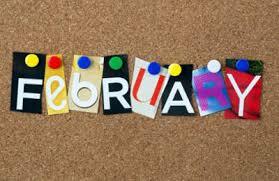 Our shortest month (February has 28 days and once in four, has one day more -- not this year though!) is packed full of holidays and special events -- hopefully busy enough to make the month fly by! Usually the coldest month in regions that truly experience winter, it is also the only month that could possibly go by without a full moon. 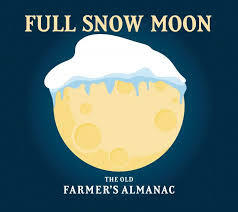 The Snow Moon is the Full Moon in February, named after the snow on the ground. ... About once every 19 years, February does not have a Full Moon, known as a Black Moon. In 2018, this was the case in most time zones. Instead, January and March had two full moons. This year, we will have a Snow Moon, on February 19. Were you aware of this fact? 2. Now, about all those holidays and special events...will you be celebrating or observing any of these that all take place in February? Black History Month: February was officially designated as Black History Month in 1976 by former President Gerald R. Ford. It is a month to celebrate the achievements and recognize the history of African-Americans. Superbowl (February 3): This year, the Patriots and the Rams face off in Atlanta, but the real fun is the numerous parties everywhere throughout the U.S. and Canada. Bring on the chicken wings! Mardi Gras (Starts February): Mardi Gras (Carnival) festivities are plentiful in the United States, but especially in New Orleans, where the holiday originated. Parades and celebrations will start gearing up during the second week of February. Valentine's Day (February 14): While not an official holiday, couples spend the day exchanging cards, flowers, and glances over romantic dinners. President's Day (February 18): An official federal holiday—which means that banks, stock markets, and government offices are closed—Presidents Day celebrates all U.S. presidents, past and present. However, the holiday was originally conceived to celebrate the birthday of George Washington, who was born on February 22, 1732. The day was first officially recognized in 1885. Family Day (February 18): observed in New Brunswick, Alberta, Manitoba, Ontario, Saskatchewan and in British Columbia. PEI Islander Day is on February 18, and in Manitoba the 3rd Monday in February is the Louis Riel Day holiday, in Nova Scotia it is Nova Scotia Heritage Day. Lunar New Year (February 5): The start of the Chinese New Year welcomes in the Year of the Pig. Kung Hei Fat Choi! 3. How many of these fun February facts (try saying that ten times fast) are you familiar with? Februa was a purification ritual and was considered as early Rome Spring Cleaning Festival. In this Festival people were ritually washed. Februs, the Roman god was named after this festival. February has an odd original name. In Old English, February was called Solmonath (Mud month) or Kale-monath (Kale or cabbage month). Feburary ...uh Feberary, uh Febuary uh Februarry uh February (Yes, finally!) frequently occurs in lists of the most commonly misspelled words in the English language and also many people all over the world are not able to pronounce it properly. Julius Caesar's calendar was reformed in 45BC. Before this reformation of the calendar, February was the only month with an even number of days. As earlier all the months had 29 or 3 days. It is interesting to find that February, March and November are month twins! This means that these three months always start on the same day as the week unless February has a Leap Year. Also in Leap Years, February has a month twin of August. 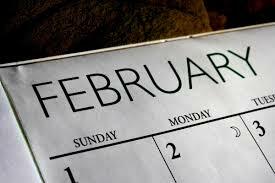 Much Ado About Nothing by Shakespeare is the only play that mentions February. This is not the case with other months of the year. Even though February celebrates President's Day, only four presidents were born in this month. It just so happens that two of America's most prominent presidents were born in February, Washington and Lincoln. The two other presidents that share this birth month are Ronald Reagan and William Henry Harrison.